All aboard the pirate ship, Bentenmaru! Most families have a skeleton or two in the closet, but Marika is understandably shocked to learn that what her family has been hiding is a skull and crossbones! 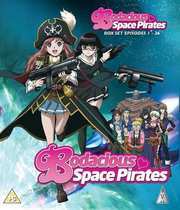 And while the revelation that her late father was a space pirate would have been earthshaking enough for most teenage girls, discovering that he was the captain of the notorious pirate ship Benten Maru will change Marika's life forever. Because, you see, pirating is a family business, and she's just inherited the position of captain. Not to mention that her father's former crew is quite intent on making sure Marika accepts the job! So what's a girl to do? Well, if you're a high school student whose prior total naval experience has been working at the space yacht club, there's really only one moral dilemma that has to be resolved: are pirates allowed to wear really short mini-skirts?